The subjects of the impact assessment are planned projects and projects being implemented, changes in technology, reconstruction, the extension of capacity, the termination of operations, and the removal of projects that may have significant impact on the environment. The subjects of the impact assessment are also the projects that have been realized without the elaboration of the EIA Study and which do not have a construction or utilization permit. Waste Management is implementation of the prescribed measures in waste collection, transportation, storage, re-using and disposal of waste, including monitoring of these activities and taking care of disposal sites after closing. Waste generator is obliged to: develop a waste management plan and organize its implementation, if it produces more than 100 tons of non hayardous waste or more than 200 kilograms of hazardous waste (Article 26 of the Law on Waste Management, Official Gazette of RS, no. 36/09, 88/10, 14/16 and 95/18 – other law). - Waste management plans for companies. “For all facilities that deal in waste management and need to obtain the integrated permit or permit for waste management, the preparation of working waste management plan implies (Article 16 of the Law on Waste Management, Official. Gazette of RS, no. 36/09, 88/10, 14/16 and 95/18 – other law). Operators in storage facilities, treatment and waste management need to submit an application and the required documentation to the relevant authority so that they could be issued a permit. Waste storage and/or transport permit will be issued to a person licensed for waste storage or transport, as defined in regulations dealing with waste transportation in public transport system, or a local transporter in accordance with regulations dealing with international public transport. The purpose of IPPC is to achieve integrated prevention and control of pollution. It lays down measures designed to prevent or, where that is not practicable, to reduce emissions in the air, water and land, including measures concerning waste, in order to achieve a high level of protection of the environment taken as a whole. The IPPC permit is permit issued by competent authority, containing conditions guaranteeing that the installation complies with the requirements of the Law on Integrated Pollution Prevention and Control (“Off.Gaz. of RS”, No. 135/04 and 25/15). The IPPC permit is issued to: the work of new IPPC facilities (from the entry into force of IPPC legislation no new facility cannot begin work without the integrated permit), work and essential changes in the work - existing facilities are required to obtain an integrated permit by 2020. in accordance with the deadlines established by the Regulation on determining the dynamics of applying for the issuance of the integrated permits (“Off. Gazette of RS, No. 108/2008 and 25/2015). Permission, exceptionally, may apply also to the termination of activities. Seveso plant operator (operator of facility where activities which include one or more hazardous substances, in equal or greater amounts than prescribed are performed) is obliged, depending on the amount of hazardous substances, to provide Notice and to prepare Major/Accident Prevention Policy or Safety Report and Emergency Plan for protection from accidents, and to take measures to prevent chemical accidents and limiting the impact of those accident on life and human health and the environment. Companies and other legal persons referred to in Art.64 hereof, taking into account their business activity, the type and quantity of hazardous substances and facilities used, shall develop a Plan of Protection from Accidents and submit it to the Ministry of Interiorand in accordance thereto undertake measures to prevent accidents and limit effects of the accident to lives and health of persons, material goods and environment. Local Environmental Action Plans are basic strategic planning documents for development and improvement of environmental performance of municipalities. LEAP require identification of main environmental problems and setting clear set of goals and actions for better environmental performance and resolving identified problems. Strategy for Local Sustainable Development is the most important long-term strategic development document of every single local community, municipality or city. The purpose of pushing forward the Strategy for Local Sustainable Development for the period 2014-2020 for municipalities in Serbia should be the harmonization of targeted developmental priorities with all relevant major strategic documents of the EU, led by the Europe 2020 Strategy, and with Republic of Serbia National Strategy for Development till 2020, in order to enhance local communities for applying for new European pre-accession funds and flagship programs, including domestic funds as well, in the future. Adoption of Local Sustainable Development Strategy for the period 2014-2020, with necessary action plans, stands as one of the bidding conditions for achieving European standards of community sectoral approach to planning and increasing the absorptive capacity of municipalities for development instruments and resources implementation (according to EU Community Strategic Guidelines). One of the largest springs of regional development financial support are the pre-accession EU funds and international community development assistance, and other development and joint-cooperation EU programs. The new EU budgetary period 2014-2020 brings more significant funds for local communities’ project proposals in environmental protection, energy efficiency, rural development and employment in the environmental and related sectors. Programmes and projects financed from these funds are to be implemented in accordance with the provisions of the Law on Ratification of the Framework Agreement between the Government of Republic of Serbia and the Commission of European Communities on the rules for cooperation concerning the financial assistance of the European Union to Republic of Serbia in the implementation of assistance under the rules of the Instrument for Pre-assistance (Official Gazette of RS, No. 124/07), as well as further adopted legal acts based on such agreement (Regional Development Act, Official Gazette of RS, no. 51/2009 , 30/2010 and 89/15 – other law, Articles 48 and 49). Strategic planning documents (strategies, plans, programs) form the basis for the municipalities’ resources good management concept realization and one of the main mechanisms for the local and regional development policies implementation. The local government (municipality or city) set development programs and ensure the protection of the environment, adopt programs of natural resources protection and usage, local action and recovery plans, in line with the strategic documents and special interests and characteristics, and determine special compensation for environment protection and improvement (Law on Local Self-Government, Official Gazette of RS, no. 129/2007, 83/14 – other law, 101/16 – other law and 47/18; Article 20, Item 1 and 11, in accordance with the European Charter of Local Self-Government). A pace of delivering a strategy involves the development of action plans for priority areas identified in accordance with the pre-accession funds that open in 2014. Setting of proper action plans should make local government more competitive in the process of approaching to European standards and provoke better trained staff to use IPA (Intruments for Pre-Accession) components. The first Action Plan is initially determined for time frame 2014-2017, and is a matrix of trajectory priorities project proposals with the activities, deadlines and budgets. The EU budget 2014-2020, which is strategically used to support the priority areas of the Europe 2020 Strategy, boost socio-economic elements of environment protection, energy efficiency, rural development and the green economy issues. Work on the thematic sections of the local strategy for sustainable development is a complex process of adaptation defined European goals to a local community specificity, recognizing and understanding the appropriate trends and changes, and ultimately harmonize strategic planning documents of all instances (local governments, provinces, republics, regions – eg. Danube Strategy, EU) for the sake of fulfilling mandatory formal requirements for applying for European pre-accession local initiatives programs funds. Strategy for local development provides a framework for further budgetary action of any municipality, among other things, due to the amendments to the law relating local governments budgets that will require local governments to perform project budgeting predominantly. Beneficiaries are obliged to spend EU funds to PRAG procedure accordingly (PRAG stands for Practical Guide to External Aid Contract Proceures. It is the European Commission’s guide on procurement and contracting procedures and rules which apply to EC external aid contracts. It is also applicable to the projects financed from the pre-accession funds instead of the public procurement rules of the beneficiary country). The principle of sustainable development in the integrated management of environmental components is identified in the set of legal acts of Republic of Serbia (eg. the Law on Environmental Protection, Article 9). One of the main policy tools for efficient use of energy is the Program and Plan for Energy Efficiency, which is passed by local government units (Law on Efficient Use of Energy, Official Gazette of RS, no. 25/2013, Article 6). EU rural development is based on the LEADER approach (LEADER stands for Links Between Actions for Development of the Rural Economy) and the functioning of LAGs (Local Action Groups). LEADER was designed to help rural people, groups, enterprises and municipalities in the implementation of integrated, high-quality and original strategies for sustainable development. Rural development is one of the key EU-level 2020 launched priorities. This standard is international, widely recognized as basic management standard applicable for all kinds of organizations (regardless of their size or activities). ISO 9001 standard is based on eight management principles of good business practice of the most successful companies. 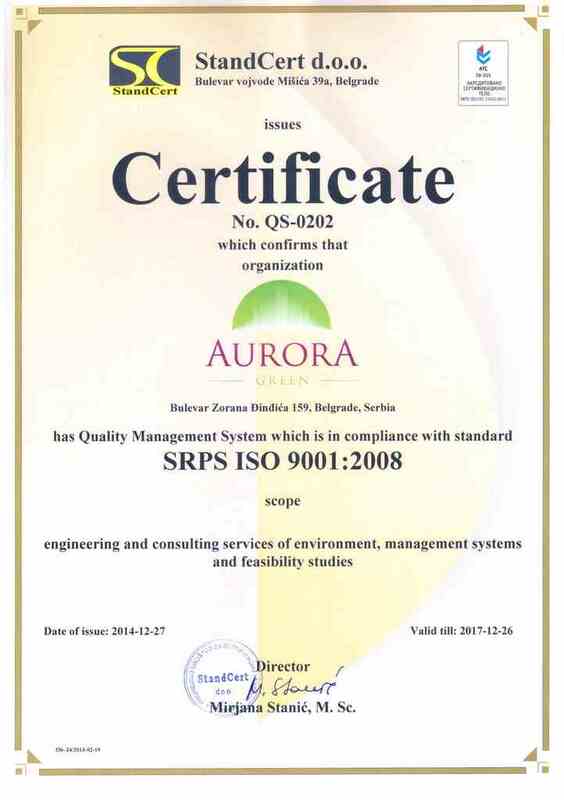 In practice, ISO 9001 is commonly used as basic management standard, compatible with other, specific management standards such are: ISO 14001, BS OHSAS 18001, HACCP etc. This standard is especially interesting for the organizations which are significant polluters. It is fully compatible with ISO 9001 and very often, implemented together with ISO 9001 as Integrated Management System. The ISO 14001 is an international standard for the control of environmental aspects and the improvement of environmental performance. Minimizing harmful effects on the environment and achieving continual improvement in environmental performance. The Eco-Management and Audit Scheme (EMAS) is a voluntary program for environment protection management which enables companies to verify their environment protection system in accordance with the relevant regulation of the European Parliament and Council. Our legal regulations partly define EMAS in Law on envirnment protection (Official gazette of RS 135/04, 36/09). EMAS includes all ISO 14001:2015 requirements, as well as some additional requirements, which makes it a more strict standard. OHSAS 18001 is a standard for occupational health and safety management system. It is intended to help organizations to control occupational health and safety risks. 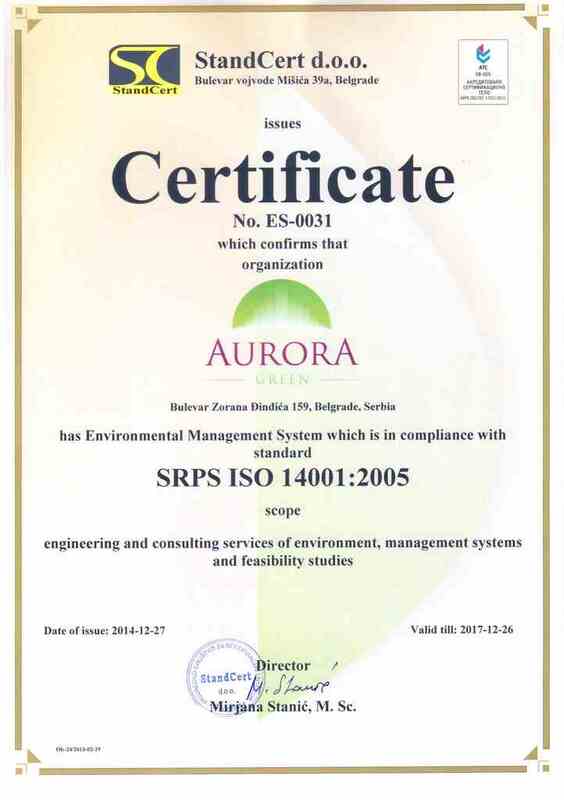 It is fully compatible with ISO 9001 and very similar in the structure to ISO 14001. HACCP is Food Safety methodology that relies on the identification of Critical Control Points (CCP’s) in food production and preparation processes. The CCPs are the closely monitored in order to ensure that food is safe for consumption. HACCP is based on seven principles. In 2005, the new standard: ISO 22000 was introduced as international standard for food safety management system. „Za sva postrojenja čija je delatnost upravljanje otpadom i za koja se izdaje integralna dozvola ili dozvola za upravljanje otpadom, priprema se i donosi radni plan postrojenja za upravljanje otpadom.“ (član 16 Zakona o upravljanju otpadom”Sl. glasnik RS”, br. 36/09, 88/10 ). Operateri postrojenja za skladištenje, tretman i odlaganje otpada podnose nadležnom organu uz zahtev i propisanu dokumentaciju za izdavanje dozvole. Dozvola za sakupljanje i/ili transport otpada izdaje se licu registrovanom za obavljanje delatnosti sakupljanja, odnosno licu koje ima svojstvo prevoznika u skladu sa zakonima kojima se uređuje prevoz u javnom saobraćaju, odnosno domaćem prevozniku, u skladu sa zakonima kojima se uređuje međunarodni javni prevoz. Integrisana dozvola se izdaje za: rad novih postrojenja (od stupanja na snagu IPPC zakona nijedno novo IPPC postrojenje ne može započeti rad bez integrisane dozvole), rad i bitne izmene u radu – postojeća postrojenja su u obavezi da pribave integrisanu dozvolu do 2015. godine u skladu sa rokovima utvrđenim Uredbom o utvrđivanju programa dinamike podnošenja zahteva za izdavanje integrisane dozvole (“Sl. glasnik RS”, br. 108 / 2008). Dozvola se, izuzetno, može odnositi i na prestanak aktivnosti. Privredno društvo i drugo pravno lice koje obavlja aktivnosti u kojima je prisutna ili može biti prisutna jedna ili više opasnih materija u propisanim količinama, koje upravlja objektima specifične delatnosti sa aspekta povišenog rizika po život i zdravlje ljudi od nesreća i terorističkih aktivnosti, dužno je da preduzme sve neophodne mere za sprečavanje udesa i ograničavanja uticaja tog udesa, na život i zdravlje ljudi i životnu sredinu, u skladu sa članom 72. Zakona o vanrednim situacijama (“Sl. glasnik RS”, br. 111/2009, 92/2011 i 93/2012) . Privredno društvo i drugo pravno lice iz člana 72. napred pomenutog zakona dužno je, uzimajući u obzir delatnost kojom se bavi, vrstu i količinu opasnih materija i objekte koje koristi, da sačini i Ministarstvu unutrašnjih poslova dostavi Plan zaštite od udesa i da, u skladu sa tim dokumentom, preduzme mere za sprečavanje udesa i ograničavanje uticaja udesa na život i zdravlje ljudi, materijalna dobra i životnu sredinu. Plan zaštite od udesa izrađuje se u skladu sa Pravilnikom o načinu izrade i sadržaju plana zaštite od udesa (“Sl. glasnik RS”, br. 82/2012) i Metodologijom za izradu plana zaštite od udesa, koja čini sastavni deo ovog pravilnika. Predstavlja osnovni upravljački standard koji je primenljiv u svim tipovima organizacija, bez obzira kojom delatnošću se bave (uslužne delatnosti, proizvodnja, trgovina, …) i koje su veličine. Standard je zasnovan na osam menadžment principa koji su osnova za uspešno poslovanje i upravo je i nastao kao rezultat “Dobre menadžment prakse” najuspešnijih kompanija.